There once was a girl who dreamed that one day she'd find the perfect man—well, perfect for her anyway. And when that man came along, she knew he was the one. They "fell" in love, married, and eternal bliss ensued. Are you willing to consider making heart changes? Typically what I hear from women (and have personally experienced) is that the "eternal bliss" ends sometime on the honeymoon or soon after. The husband and wife enter something I call the "Fierce Woman/Fearful Man" cycle, and walls begin forming that isolate the couple from one another. When that happened with us, I entered a long, dark season of hopelessness. 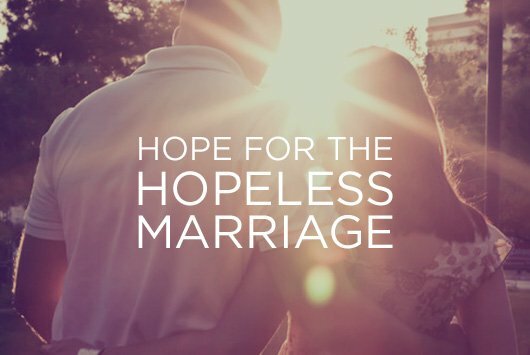 You might be encouraged by clicking here to watch our marriage video. Things would never get any better. I was trapped with someone who I didn't want to spend the rest of my life with. There had to be an answer to our problems, but he wasn't willing to change. If only he would have gotten counseling, we might have had a chance. I had tried everything, but nothing that I tried seemed to make a difference. He still acted like I was the enemy. Your relationship may not improve. In fact, it may get worse. But improving your relationship shouldn't be your ultimate goal. All our motives and desires must be rooted in God's glory. When we approach our life from that perspective, then we can trust that, whether or not I see the changes occur that I think are necessary, I still have reason to praise and thank God. Jesus Christ is our "all-in-all," not our husband, children, or life circumstances. When our hearts are firmly held by His grip, we can have joy in that alone. Remind yourself often of the fact that you've not yet seen the rest of the story. God is always at work, and He is able to do more than you can imagine! I'm trapped with someone who I don't want to spend the rest of my life with. "Trapped" is a very strong word. I know some women truly are experiencing a nightmarish life, and for them, there is recourse. If your husband is abusive, controlled by addictions, involved in criminal activities, or immorality, please do not remain silent. Follow the guidelines in Scripture for confrontation, seek help from the spiritual leadership in your church, and contact the proper authorities when necessary. However, some women feel "trapped" because life hasn't turned out like they hoped and dreamed it would. Rather than focusing on how disappointed you are with how things have turned out and expecting it to never improve, apply yourself to being thankful in all things. Ask God to provide His grace for hope. With God, we have every reason to hope for His good works to be accomplished! There must be an answer to our problems, but he's not willing to change. My question to you is: Are you willing to change? I've found that blaming the spouse is the most common reaction when there is marital conflict. (It all started with the first couple.) I blamed my husband for years and truly believed he was the source of all our problems. But once I stopped blaming my husband and started asking God to change me, He eventually changed my husband! It didn't happen overnight, in fact, it took a couple of years before I began to see major breakthroughs and changes. But the work God did in my husband's life is amazing. Are you willing to consider making heart changes? Will you ask God if there are heart issues you're not even aware of right now? If only he would get counseling, we might have a chance. Counseling—good biblical, helpful counsel—is a great resource. But many men fear turning to a counselor for help. If you've appealed to him for this, and he's rejected the idea, begin asking God to open your eyes to a spiritually mature couple in your church family that might be trustworthy friends. Invite them over for dinner, seek out time with them, and look for opportunities to be involved in activities together. As you build a relationship with mature believers, it will allow a foundation for them to speak truth into your lives and may develop into a healthy accountability friendship. I've tried everything. Nothing I try seems to make a difference. He acts like I'm the enemy. You are not the enemy. Your husband may feel like you are, and at times you may treat him as though you are, but you are not the enemy. We have a very real enemy, and I guarantee you he is delighted with you taking the fall for his evil schemes. It's vitally important for couples to develop unified goals and purposes in marriage (and having fun along the way helps tremendously!). When you operate together for a common good, it develops loyalty. Look for ways you can have a unified purpose. It can be as small as being on the same team in a game of dominoes with friends or as complex as working through your five and ten year goals. Parenting brings its own challenges, so it is important to work toward having a united front when it comes to choices you're making for your children. Communicate to your husband (often) that "you're on his team!" Just speaking that clear affirmation to him will change the atmosphere in your home. Finally, pull out Colossians 3:12–21 and consider using this as a "template" for home life. Ask your husband if he would be willing to read this passage to the family after dinner one evening (before everyone goes their separate ways) and open up discussion between family members on how it would look to flesh this passage out in your home. Maybe this could be a month-long project of tackling a phrase at each family meal and discussing it. Have you lost all hope? How can you replace your hopeless feelings with the truths we've been remembering together today? Previous Post Modesty, Beauty, and Men. Why Should We Care?